Barcelona are reportedly set to be without Samuel Umtiti until 2019, as he prepares to travel to Qatar to undergo treatment on his troublesome knee. The 25-year-old has been a crucial presence in the Barca defence, but coach Ernesto Valverde will seemingly now have to identify a solution, whether that’s an internal one or a January signing to cover the absence. As noted by the club’s official statement, Umtiti will continue to receive treatment in Doha as it appears as though he will avoid the option of undergoing surgery, while AS add that it’s most likely going to keep him out of action until the New Year. Barcelona will certainly be hoping that it resolves the issue as the World Cup winner has been restricted to just eight appearances so far this season, missing eight games due to the ongoing knee troubles. While treatment hasn’t seemingly worked to date as he was forced to sit out the midweek win over PSV Eindhoven in the Champions League, the Catalan giants will be hopeful that the new course of action will aid his recovery and help him come back in 2019 without the knee bothering him. Nevertheless, in the more immediate future, it’s a real blow for Barcelona as they’ve already conceded 19 goals in just 13 La Liga games this season, giving them the joint-worst defensive record of the top eight sides along with Real Madrid. 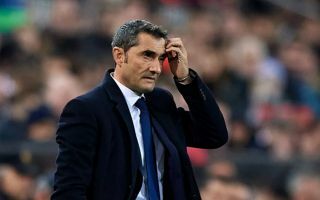 Losing their best defender isn’t going to help that situation, while with just Gerard Pique and Clement Lenglet as his reliable centre-half options, Valverde has a potential headache on his hands as that simply isn’t enough quality and depth to compete on multiple fronts. In turn, perhaps a signing in January to rectify the issue could be the smartest idea from Barcelona while Umtiti remains sidelined.